We all have concerns around money. How would you like to feel confident about your personal and financial decisions? Capital One is helping people get confident with money. From their Capital One Cafes and the Banking Reimagined Tour, they are taking a different approach to financial services. They are combining human connection and banking into one! This is a big year for Capital One. Their Capital One Cafes have been so successful over the past few years, that they are now expanding them across the United States! These banking cafes have lounges, couches, tables, private meeting rooms and more. The Capital One Cafes “Strive to provide customers with a unique and memorable banking experience”. One way they do this is by having a full-service Peet’s® coffee bar and knowledgeable Capital One Ambassadors. You can relax for awhile, enjoy a coffee while working on your laptop or engage with one of the Capital One Ambassadors on personal goals and financial inspirations! There is no pressure, it is a very laid back atmosphere. I visited the Capital One Cafe in Denver and was pleasantly surprised with this new concept! The space is conveniently located downtown LoDo in the beautiful Triangle building by Union Station (1550 Wewatta St Denver, CO 80202). It is a very open design with plenty of space to work in peace or sip a latte with a friend. It was hip, cozy and comfortable. Capital One Ambassadors are more than just financial advisors. They are trained life coaches ready to consult with you about what it is you seek in life – both financially and personally. Private meeting spaces with white boards, tables and chairs are available to anyone to use, non-profits getting first priority. You can speak to an associate and explore banking services or just take advantage of the free work spaces. Try out new digital and financial tools. Free Wi-Fi, free charging ports and fee-free ATMs. Peet’s® Coffee Bar is full service with coffee, tea, snacks and more. All the pastries are from local bakeries! If you have a Capital One Credit Card you get 1/2 off your purchase! A ten-city tour with a tricked-out financial planning bus! Capital One’s new banking concept on the road! The Reimagined Tour Bus is a state-of-the-art 54-foot trailer with interactive features. It’s a virtual experience that lays out a road map for your future. You go through multiple digital questions about your passions, core values, and future wants. Do you have goals for a house, family, dog or wedding? After getting to know you, it brings your goals to life with a virtual reality experience of your future. You can also record a personal video message to send to yourself. Choose to send it right away or even in 18 months! 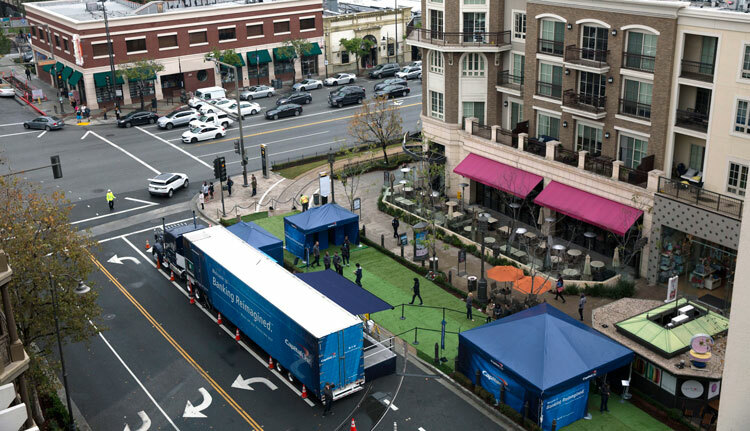 This weekend the hands-on digital experience tour bus will be in Denver. The Denver Banking Reimagined℠ Tour will be held at Four Seasons (1111 14th St, Denver, CO 80202) February 25-26, 2017 from 10am – 6pm. Visit to learn more about your relationship with money and gain financial confidence! While other banks are closing – Capital One has been reinventing! 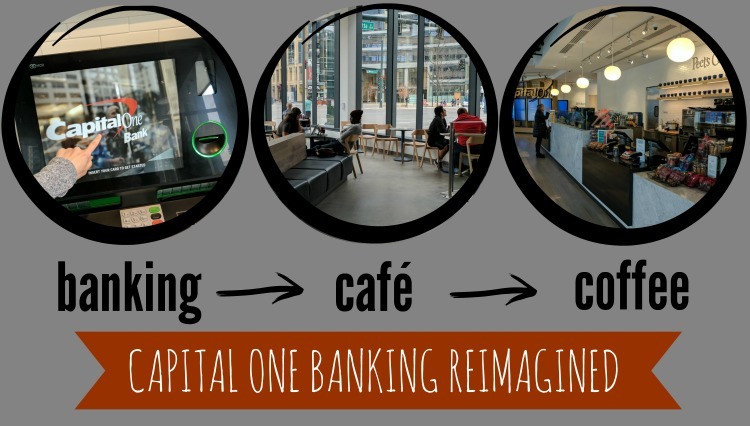 One part cafe,one part financial institution – this vision turned reality is genius! In my opinion, Peet’s Coffee & Tea espresso bar, free wifi, spacious seating areas and private meeting rooms, are much more useful than a stuffy bank with tellers. These cafes are such a relaxing experience – all the comforts of the cafe combined with financial ambassadors on hand to help with banking needs! It’s unique, creative and smart. 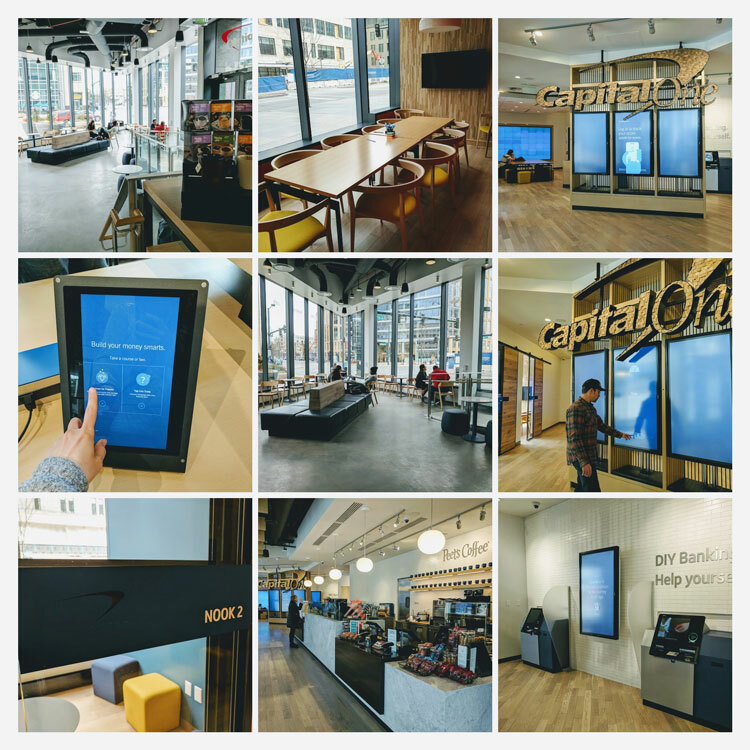 Banking is back to life with Capital One Cafes – I am loving this concept! What do you think about this new idea of banking cafes – that combines human connection with financial confidence? I really love that they are changing the way old style banking was. It’ll definitely help people feel more relaxed and confident…coffee alone gives me confidence lol! We have a capital one credit card. Sounds like capital one has really tried to make banking, saving and everything else easier and faster. This is such a great idea! I never would have thought of a bank going this route. But, they do need to stay ahead of the game. Great job Capital One! I had no idea Capital One had these cafes! They sound awesome, and I really like Capital One! I hope they open one near me soon! I hadn;t heard of this concept before. Financial confidence is important, as is trusting the folks that you bank with. I’m so jealous that my bank doesn’t have a cafe. Cafe and coffee while banking? Yes, please! What a great concept. I wonder if there’s one in Charlotte. I’ll have to check. Wow, what a neat concept! I am getting much more comfortable with finances but this would be so beneficial. I am always wondering if I am saving enough and investing in the right places. I love the café idea to make customers feel more comfortable. Wow, what a neat concept! Gaining Financial Confidence is definitely something I’m trying to achieve right now in my 20s. I’ve never heard of this but it sounds cool. I’m always in need of financial confidence.